Landscape retaining walls are used on sloped properties for a few different reasons. However...it is often better to re-grade if possible. This will save you lots of money! This is not always possible or desirable though, but I just wanted to bring out the fact that it should be considered. Different materials can be for walls, some more expensive than others. The height and length of the wall, along with the materials used, will determine the cost. Some materials to consider are decorative block, brick, and natural stone (my favorite). Sometimes a combination of re-grading and walls works well too. This will reduce the height of the walls and also the cost. Natural stone landscape walls are just one type...expensive but beautiful. 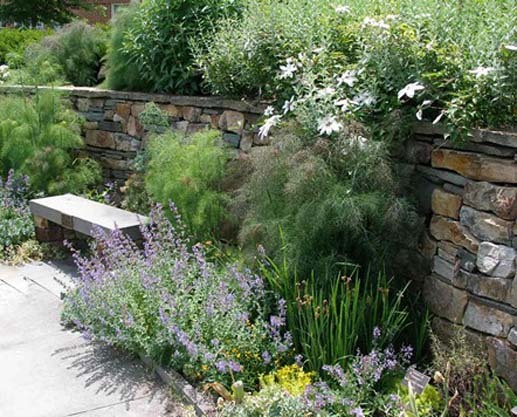 There are various situations where a retaining wall might be a good idea in your landscape design. Most of the time this would be to create a level area. As a play area for children, whether it be lawn or for a playset. For a patio or pool or other outdoor usable spaces. 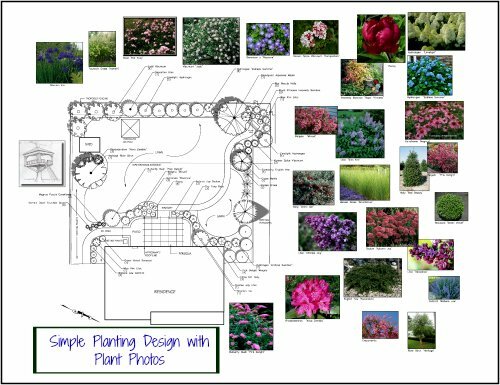 To create terraced gardens...relatively flat areas for plants. To reduce a slope for easier mowing. Easier access to areas of your property. In this design, large boulders are set into a wonderful stone wall. The stones have variation in color, which provides even more excitement. This wall is dry laid for a natural look. Plants and flowers serve to soften the stone wall. Differing plant heights are used also, but the wall is still able to be clearly seen. Slopes should be kept to a maximum of 3:1 (33%). What does this mean? It means that for every 3 feet of distance, the change in height should be no more than 1 feet. Example: The difference in elevation for a property area that is 30 feet long should not be more than 10 feet...maximum. This will help you determine if walls are needed and how many. You can do design one taller wall for one large area, or you can incorporate a few lower walls and have the areas divided into sections between the various walls. Landscape retaining walls should be no more than 4 feet tall, in most cases. Walls over 4 feet high start to look more massive. Walls 18" to 42" work well in the landscape. If you make your wall 18" to 24", you can use it as a seat wall. You can read more about the heights of retaining walls. Be sure to leave an adequate amount of room next to landscape retaining walls if you are planting at the bottom (or top) of the wall. The absolute minimum depth I use is 18". This would be for terraced areas or planting beds along a patio wall. Always keep safety in mind when incorporating landscape retaining walls. A child or adult can fall over the wall. 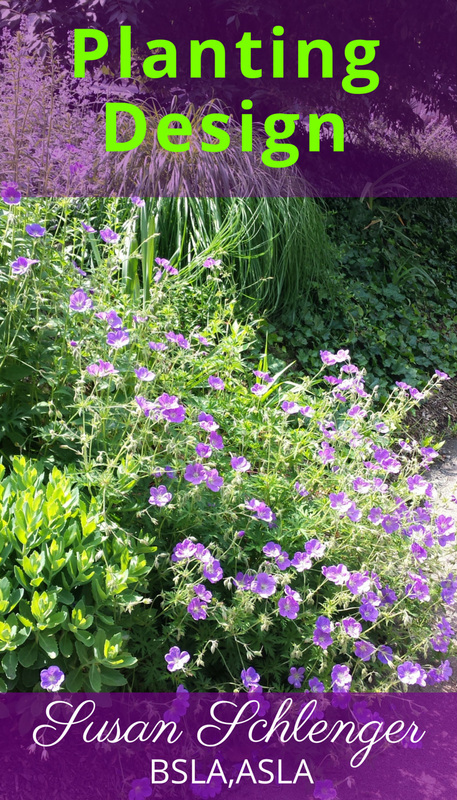 To eliminate the need for fencing at the top of a taller wall, create a planting bed at a minimum of 3 to 4 feet wide. Use fairly tall and wide evergreen shrubs, such as Blue Holly, Rhododendron, Boxwood, Cherry Laurel, or the larger varieties of Japanese Holly. 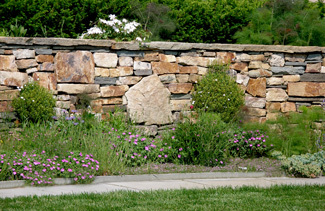 There are many different materials that landscape retaining walls can be made out of. There are many patterns, colors, and sizes to choose from. Like pavers, this block is made from concrete. This is one of the less expensive choices for landscape retaining walls. Various companies make this material, such as Versa-Lok, Eagle Bay, Belgard, Anchor, Cambridge and so on. The color of the block can be uniform or can have a few colors blended together. I have found that companies often produce wall stone colors that go well with their paver colors. For example, Belgard Dublin paver in Ardennes Gray is one that is a medium gray with tan running through it. Belgard offers a wall stone called Celtik in Oxford Gray. The two blend together very nicely. The Celtik wall stone comes in either a mixture of stones that are three inches high and various lengths, or six inches high and various lengths. You can choose either one. However, if you were to use both, you would end up with a very interesting mosaic type look. Brick is mortared at the joints, and therefore a more expensive wall material. Normally the wall is built from concrete block and then the brick is mortared to the wall. It looks well with bluestone and it is a natural material made from clay. 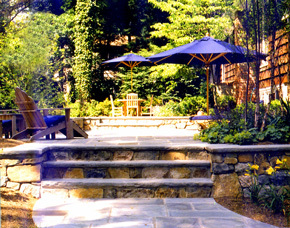 You might consider a bluestone cap on the wall, particularly if it is to be a seat wall. This is my favorite! There are many types of natural stone. Fieldstone is always a nice choice. It basically comes in three sizes and the choice would be determined by the height of the landscape retaining walls. Smaller walls look better with the smaller stones, while the taller walls look great with the larger ones. Tip: Place landscape boulders at the ends of the wall and/or mix them in with the rest of the wall stone. Makes a nice landscape element, but one of the most expensive types. Natural stone is used. The stone might be naturally formed stones or various sizes or face stone. Face stone is thinner and is mortared to a concrete wall. Another alternative. I feel it is inferior to the other possible choices, due to the possibilities of cracking. For a finished look, a bluestone cap (top of the wall) can be used with any of these materials. It should have between a 1/2" and 1" overhang on all sides. If there are to be plants at the top of the wall, you may choose some plants that will hang over the wall, such as Ivy or some types of Junipers. In this case, you can eliminate the wall cap.